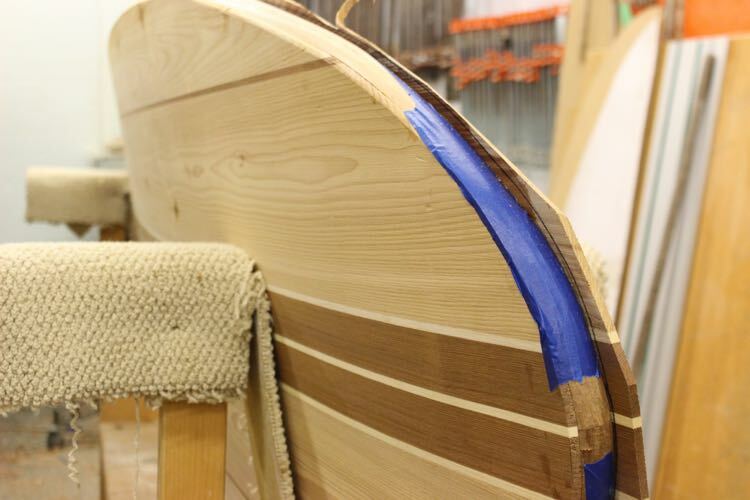 The next step in building a hollow wood paddleboard is shaping the top panel. The secret to shaping the top is removing the excess material without touching the tape. Everything under and below the tape is basically complete. Ideally you should be able to remove all of the excess until only a paper-thin layer is covering the top of the tape. 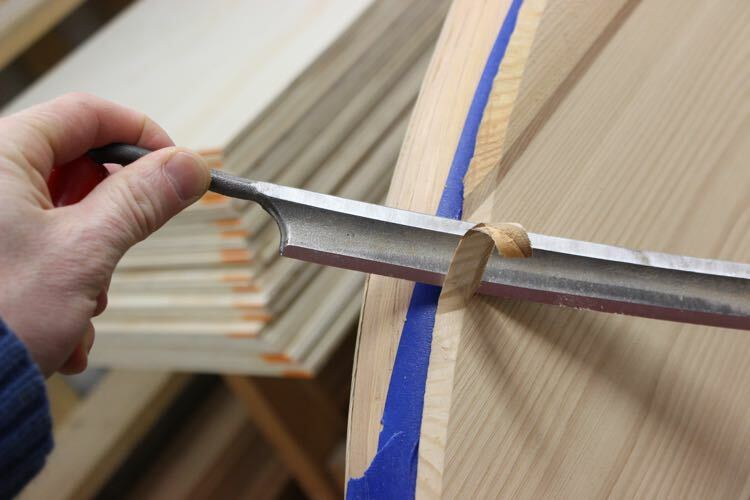 With a really sharp tool the final stroke should cut this thin layer and leave you with a perfectly fair transition from rail to deck. The steps below will make this clearer. If you have a drawknife it is the tool of choice for fast removal of the excess material. For those not familiar with a drawknife, it’s basically a sharp blade with two handles that are used to debark trees. For building hollow wooden SUPs it is useful to hog off the bulk of the excess material really quickly. If you do not own one I do not recommend buying one if you are building a single board. I can complete this step in about 10 minutes with a drawknife and it might take twice as long with a spoke shave. The image above shows a drawknife cutting a perfect curl across the grain. You can see how the grain is splitting between the summer and winter growth rings. Travelling across the grain like this there is little chance of things going wrong even taking aggressive cuts. It helps to keep your tools angled away from the rails at a shallow angle to prevent kicking the tape or rail. Same board different grain as we are running parallel to the grain. Cuts like this are only safe with the grain running out (off the plank) in the direction of travel. (Left to right) If you were to move from the right to left you would have problems very quickly. The wood would split inward and you would have a crack heading into the board! If you ever start getting a split going the wrong direction, STOP, and simply take light passes in the other direction until the problem is removed. 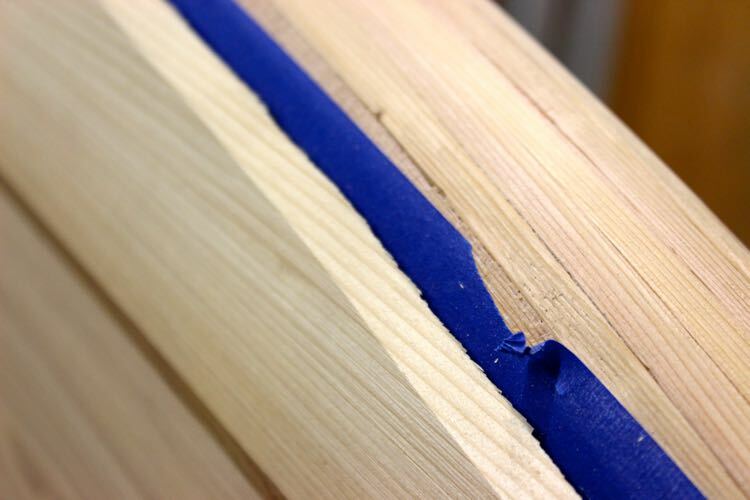 This usually happens around knots and other imperfections as the grain change directions. 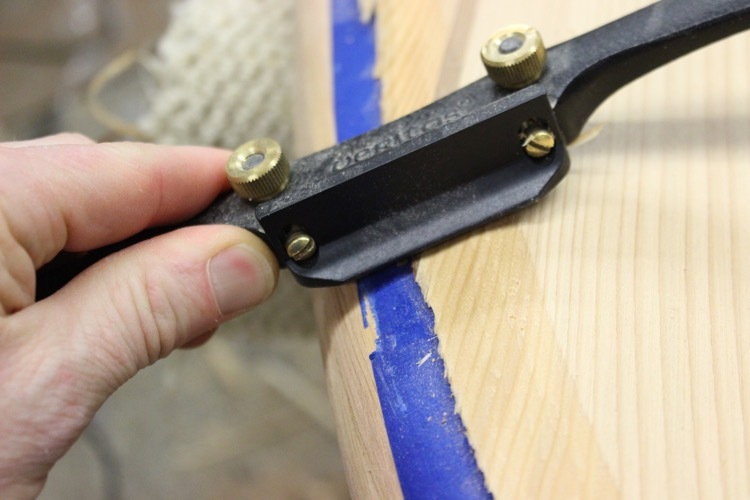 Having spent a fair amount of time using a drawknife, I stop when I can see half of my painters tape or when I start catching it by mistake. If you are using a drawknife for the first time you might want to stop sooner. A spokeshave will do the exact same thing it is just slower as the shavings are thin. 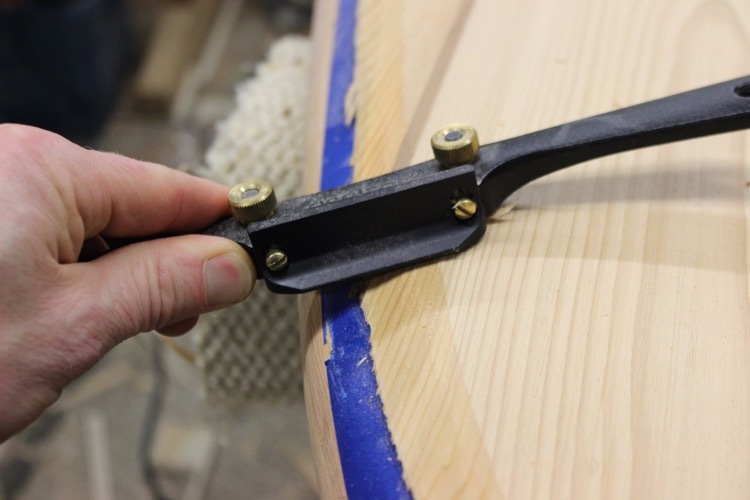 With half the tape showing all the way around the paddleboard it is time to switch to a spokeshave or plane. 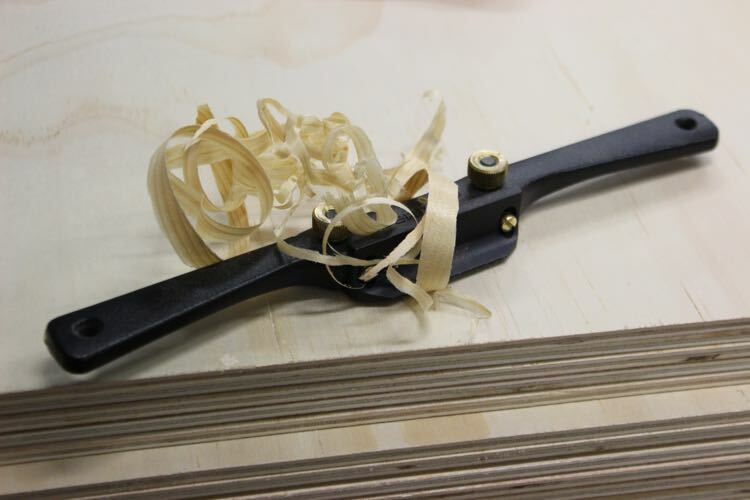 The spokeshave is set to take very thin shavings compared to the 1/8″ – 1/4″ curls I was taking with the drawknife. It is slower but has way less chance of digging in and causing any damage to the rails. Simply continue to work your way around the board removing the excess material. A No. 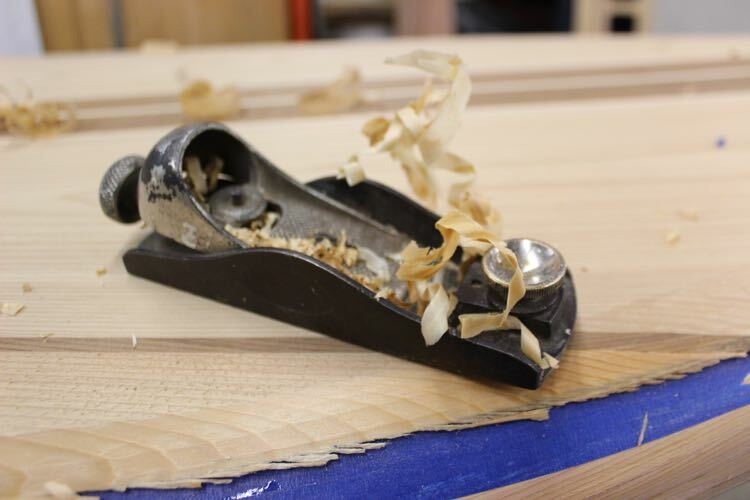 4 bench plane or smaller block planes are good tool choices as the longer bases create a smoother profile. 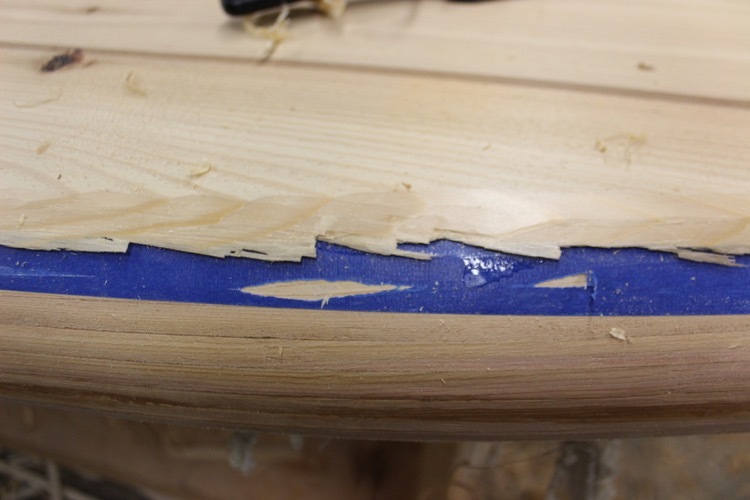 As the nose kicks upward you pretty much have to use a spokeshave as the block planes base will be too long. As the material melts away with each stroke you will have to change to a shallower angle. I usually just make flat cuts at this stage, as it is easy to keep the facets symmetrical. It doesn’t matter how you tackle this step as long as you are staying off of the taped area as it is already shaped. If you see something like this, you are going the wrong way! Simply change your direction of travel and things should go much smoother. As you progress, it is much easier to see where you are going. With three-quarters of the blue tape exposed all the way around you should know what direction you have to move to get nice clean cuts. It is normal to have to switch directions as you move around the board. 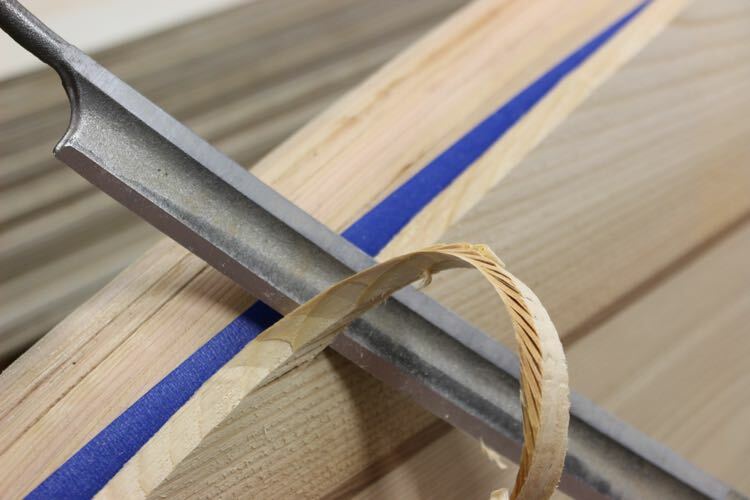 The grain changes directions around knots, defects, cathedrals and the curve of the board changes the angles. If you have difficult grain to deal with you might want to stick some tape on the top deck to signal these trouble areas. It is recommended that you stop and sharpen your tools as you remove the last of the excess material. In areas like this where there are huge gaps between the summer and winter growth rings you should use the longest tool you can. 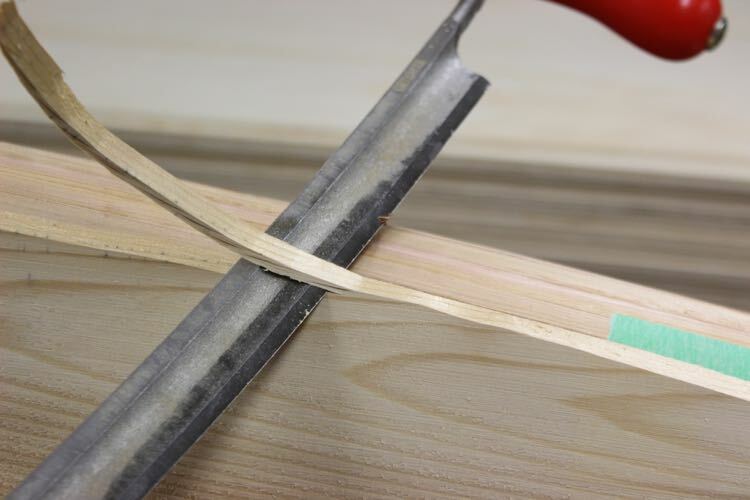 If this area was shaped with a spokeshave it would be hard to keep fair lines as the tool will cut the softer wood faster than the harder wood and you will end up with a wavy curve. A No.4 bench plane and a block plane (shown) have a much longer base and the will straddle over the softer wood. I like to use nothing smaller than a block plane as I fair the lines. You have to switch back to a spokeshave near the nose and tail as the base of a plane is simply too long to follow the rail. 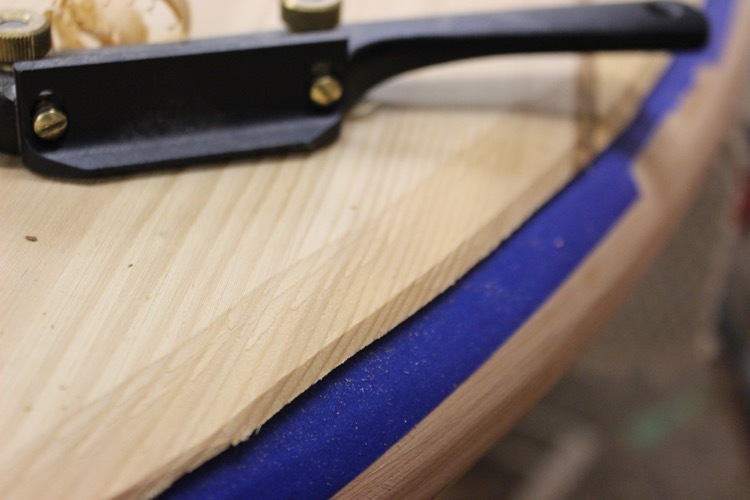 The final pass is usually done with a spoke shave as it provides more dexterity and a lighter touch.